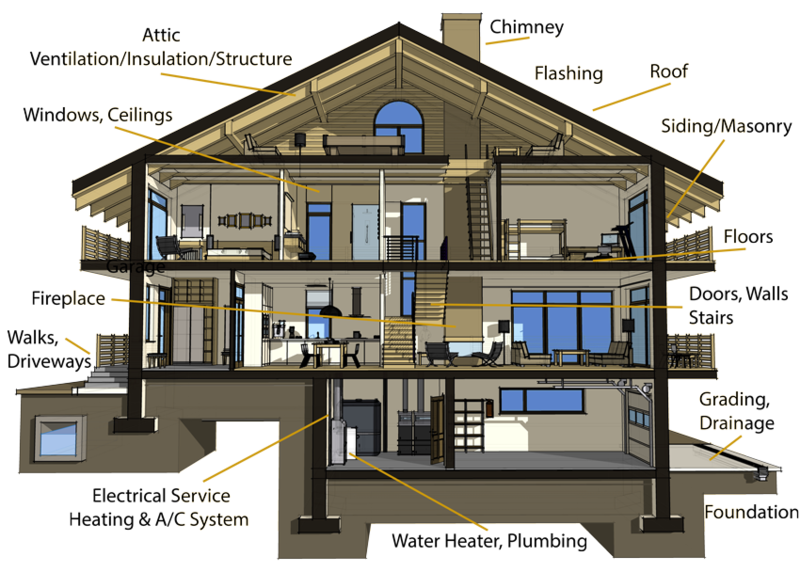 Eagles Eye Home Inspection, LLC™ offers home inspection services starting at just $295. During our inspections, which entail a thorough and non-invasive visual assessment of the property, we abide by the Standards of Practice as stated by InterNACHI, ASHI, and ICC. Sellers can benefit greatly by being made aware of the problems in the home and addressing them even before listing. During a Pre-Listing Inspection, we will uncover the issues in the home so that sellers can best prepare their properties for the market. Builders can find and address oversights in the building process with the results from a New Construction Inspection. We will inspect thoroughly for any issues in construction so that they can be repaired before the final walkthrough. By having a construction project inspected at a number of significant phases, builders can be more certain of the condition of construction before moving on to the next phase. 4 Point Inspections are often required so that insurance providers can get an understanding of a home’s four significant areas. During the inspection, we assess the current condition of the roof, electrical system, plumbing system, and HVAC system. To protect themselves in the situation where strong winds and harsh weather damage a home, many insurance providers offer discounted rates after seeing a passing report from a Wind Mitigation Inspection. During the inspection, we assess how protected a home is from wind damage and can suggest upgrades for further mitigation. Older homes often contain dangerous lead paint. We will scrape a paint sample from different areas of the home to test for the presence of lead. Mold is everywhere, but its existence can become a major issue if it finds a moist place to collect and grow in the home. As it grows, it can begin destroying home surfaces and structures. During our Mold Testing services, we find moisture intrusion and mold growth so that you can remedy or prevent a mold issue. Termites and other wood-destroying organisms will cause major structural damage to a home if left unnoticed or unaddressed. During a WDO/Termite Inspection, we search the home for signs of an infestation, existing damage to the home’s wood, and moist areas of the home that can attract these types of pests. It can be unsafe to use or consume the water in a building before having it professionally tested. During our Water Testing Services, we check water for harmful bacteria and other contaminants. Energy-efficient homes save owners money on utility prices over time. During an Energy Audit, we will assess the home to find possible energy-related issues and suggest what upgrades could be made to make the home more efficient than it currently is. There are some situations in which a third-party can help a buyer and seller remain on the same page about home repairs. After we have completed an initial Buyer’s Inspection and the requested repairs have been made, we can do a Re-Inspection to ensure that all agreements were honored. Once a new home is built, it is often sold with a 12-month warranty that protects the new owner from having to pay to repair defects in construction. To take full advantage of this warranty, homeowners should have the home inspected during the 11th month for covered damages and defects. Loan providers want to know what they’re getting into before lending money to a client, so many will request to see the report from a Loan Draw Inspection. During the inspection, we assess the home’s current condition and estimated repair needs. During a Weatherization Inspection, we will inspect the home to determine if energy is being lost, and if so – how much. This information will help buyers and owners weatherize their homes and better prepare for harsh seasons. Sewer lines can’t be inspected with the naked eye, but it is still important to understand their condition before purchasing a property. We use a sewer line camera to inspect lines for cracks, tree roots, and other blockages or damage. Buyers and owners of commercial properties, such as strip-malls, warehouses, and storefronts, should have the property inspected before use. We check that the building is safe and uncover defects that should be addressed before use or purchase. Radon is a gas that naturally occurs in uranium-rich soil. Exposure to radon causes lung cancer. If small cracks exist in the base of the home, radon can rise inside and become trapped, building up to dangerous levels. The gas can’t be seen, tasted, or smelled, so professional equipment is required to measure levels in the home. We will use an aerial drone to collect high-quality images from above a property. These pictures give us and owners or buyers a better understanding of the property and its environment. The drone is used to assess the home’s roof condition and help us visualize the property’s surrounding area. With a Thermal Imaging camera, which picks up on areas of heat disparities that we couldn’t see with the unaided human eye, we are able to detect moisture intrusion and problems with insufficient or missing insulation, as well as electrical hot-spots. Call Eagles Eye Home Inspection today to schedule an appointment with an honest and dependable inspector. Ask about our military, veterans, first-time home buyers, repeat customers, senior citizens, and local Henry County discounts.